Just one week ago, Carmelo Anthony was traded to the Knicks and we have been tracking Melo’s effect on ticket prices ever since. Melo’s debut as a Knick was the biggest Knicks regular season game in 16 years. 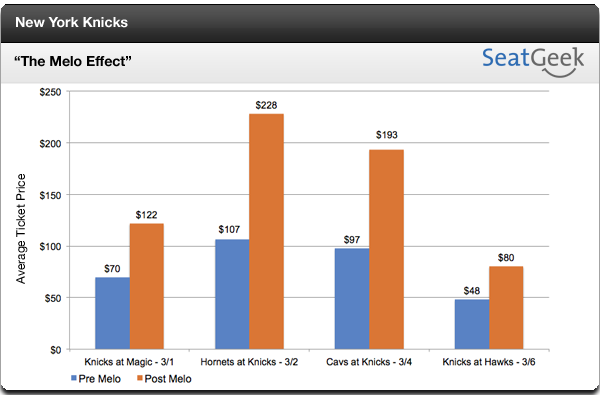 Melo has not only spurred an increase in TV viewers, he has also been the catalyst for a boost in ticket prices. Compared to Knicks ticket prices prior to the Melo trade, ticket prices have practically doubled across the board for both home and away games. Taking a look at the upcoming games, this trend does not look like it is slowing down. Even the Cavs at Knicks game this coming Friday is averaging just under $200 per ticket since last Monday. Over the past week, the new squad has had their ups (a nice comeback victory against the Heat) and downs (a loss against the Cavs). Once they start to mesh a little better, the new Knicks team looks very promising and be a tough contender coming out of the Eastern Conference.